New integrated water management planning policies were gazetted in October 2018. Stormwater: The net increase in run-off from urban development due to water not being able to seep into the ground because of impervious surfaces, such as roofs and roads. New Integrated water management clause in the state’s Planning Policy framework (PPF) to embed IWM objectives and strategies into urban land-use planning. If no minimum is specified in a schedule to the zone, 20 percent of the site. Meet the current best practice performance objectives for stormwater quality as contained in the Urban Stormwater – Best Practice Environmental Management Guidelines (Victorian Stormwater Committee, 1999). Contribute to cooling, improving local habitat and providing attractive and enjoyable spaces. The SEPP (Waters) formally commenced on 19 October 2018. This is the largest change in stormwater regulation related to Councils in over a decade. The SEPPs outline the uses and values of the environment that the community want to protect (these are called beneficial uses) and define the quality of the environment required to protect these. SEPPs also identify the rules for decision makers and obligations on industry in order to protect water environments. Minimise the pollution of stormwater. The SEPP (Waters) also requires that owners and managers of assets created to protect water quality (including constructed sediment ponds and wetlands) must ensure those assets are designed well and maintained properly. For redevelopment sites under 1 hectare, InSite water allows designers to quickly and effectively demonstrate requirements of the Integrated Water Management Planning Policies and the SEPP (Waters). InSite allows this because it takes a multi criteria approach, where one stormwater device – such as a water tank or WSUD device such as a raingarden or infiltration pit can demonstrate how it meets both hydrology and environmental requirements. In addition we allow users to calculate Volume reduction to minimise the quantity of stormwater leaving the property boundary. 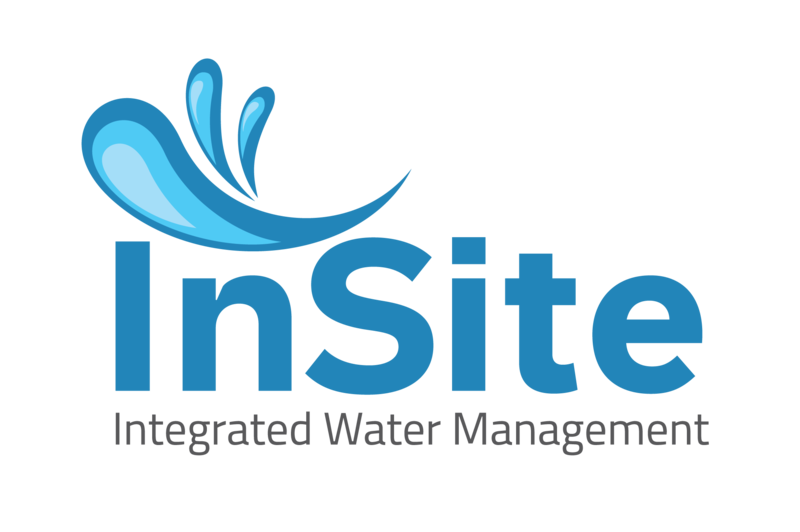 InSite water includes clear targets in line with Integrated Water Management requirements, and measures performance of a design to show whether those targets have been met. Geoscience Australia has just released the final draft of Book 9 – the Urban Book of the ARR 2016 guide – a guide to flood estimation. ARR is the main standard used by civil engineers and hydrologists in Australia for design of stormwater infrastructure. This is the first major update of this standard since 1987, and it is a step change in how stormwater infrastructure is designed. 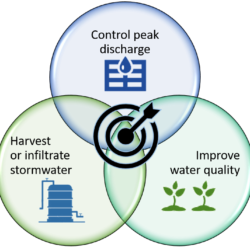 In the last 30 years, stormwater approaches have evolved significantly, and the 2016 ARR guide introduces multiple objectives as well as flood mitigation (e.g. resilience, WSUD, liveability, sustainability and affordability) and the perspective of other disciplines such as aquatic ecology and landscape design. 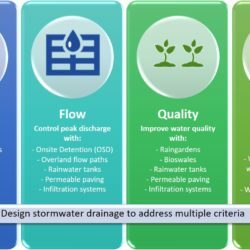 What has changed in stormwater design? Strategic use of water efficiency, rainwater, stormwater infiltration and wastewater recycling at multiple scales can supplement the performance of centralised water supply and drainage systems to provide more sustainable and affordable outcomes (ARR 2016). These integrated strategies reduce the requirement to transport water, stormwater and wastewater across regions with associated reductions in costs of extension, renewal and operation of infrastructure. In particular, the concept of volume management has been emphasised (ARR 2016, Book 9, Ch. 4). The historical practice of designing urban stormwater systems has focused on peak flows, stormwater detention, and conveyance in hydraulically efficient pipes and channels. It is now recognised that volume of stormwater runoff, urban amenity and water quality treatment also need to be managed. The ARR 2016 guide discourages the use of stormwater detention in favour of VOLUMEmanagement, except in clear cases where existing local street level pipe infrastructure needs protection in the face of increased impermeability through ongoing urban redevelopment. This is achieved through design and installation of volume management and water treatment devices, such as rainwater retention tanks, rainwater infiltration systems, and unlined biological treatment devices such as raingardens, tree pits and bioswales. The design of volume management and stormwater treatment trains must include objectives that are relevant to the site, the surrounding catchment and receiving waterways. An adequate number of facilities are required to be built and maintained in catchments to ensure that stored, harvested or infiltrated stormwater will significantly reduce peak discharges at catchment outlets, or where existing downstream infrastructure is overwhelmed by redevelopment. Typically, compliance with ARR 2016 book 9 is also requires meeting stormwater QUALITY targets. 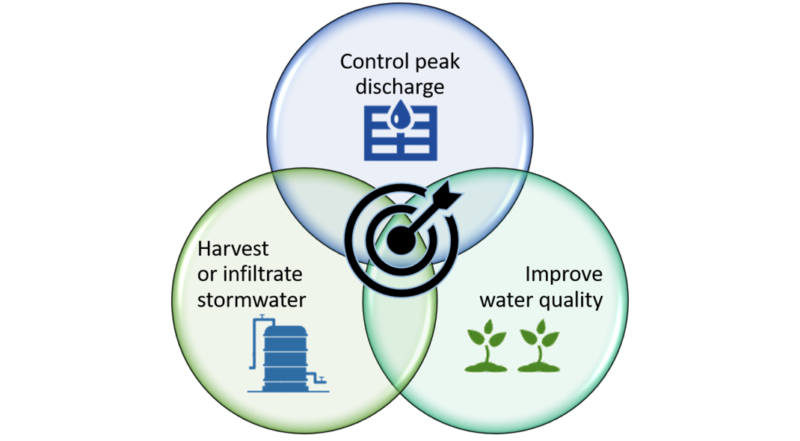 The InSite tool uses the targets from the Urban stormwater: Best practice environmental management guidelines (BPEM, CSIRO Publishing 1999). By including a stormwater quality calculation engine, InSite water allows designers to demonstrate they are meeting stormwater quality guidelines using treatments such as raingardens, bioswales, rainwater retention tanks, and infiltration. Limiting FLOW from a site using On-Site Detention (OSD), is still allowed to extend the usable life of existing Council stormwater pipe assets. With the release of the new ARR 2016, Engineers Australia recommends all stormwater practitioners, including Councils, revisit and revise their stormwater management practices, methodology, policies and guidelines to include volume management and water quality targets. InSite water has been designed from the ground up to help engineers and designers meet the requirements for the ARR2016 urban book standards. We allow projects to quickly optimise for the 4 multiple criteria targets of VOLUME management (retention), peak FLOW control (detention), stormwater QUALITY, and EFFICIENCY for drought resilience. For example we allow designers to optimise the size and setup of a rainwater to meet retention, detention, stormwater quality and water efficiency targets with the one device. Our mission is to make Integrated Water Management quick to calculate, cost effective to implement, while maintaining the engineering rigour of the ARR 2016 standard. Engineers Australia (2016) Australian Rainfall and Runoff:A guide to flood estimation, Book 9, Chapter 3 Philosophy of urban stormwater management. 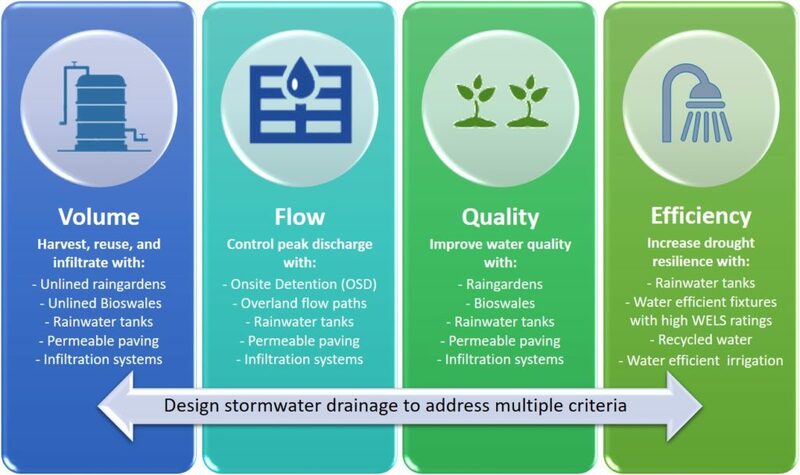 Stormwater: Best Practice Environmental Management Guidelines. CSIRO 1999. Electronic edition published by CSIRO PUBLISHING, 2006.